Metapost: COMMENTS! OF! THE! WEEK! For a character whose whole schtick is giving advice, Mary Worth’s given some pretty bad advice over the years. There was the time one of Mary’s friends confessed she still had feelings for a now-married old flame whom she hadn’t seen in years, and Mary told her to go ahead and contact him and pretend it was all “platonic”, because what could possibly go wrong. There was also the time that she told a woman haunted by memories of being stood up at the altar that you can fix sadness by choosing to remember events differently from what actually happened. And these are just the first two instances that leapt to mind, so what I’m saying is that it’d probably be premature to call today’s strip the worst advice Mary’s ever given anyone. But still, telling someone that “this thing you’re about to do will probably anger your daughter, so rather than talking to her about it you should just do it and then she’ll have literally no choice but to accept it and your relationship is gonna be great” isn’t really a good idea, you know? 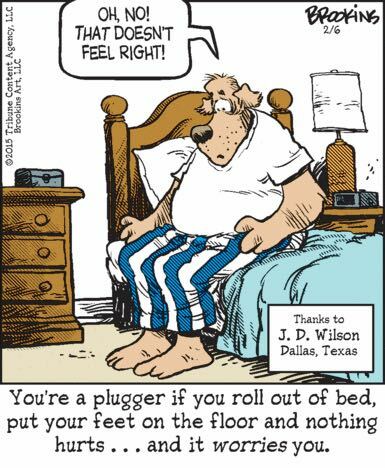 Speaking of all-time lows, this panel can’t match the sheer awful concentrated sadness of 2006’s classic “Rhino-Man hocks his TV”, but you have to admit that “physical pain is a plugger’s constant companion, one he eventually learns to rely on for his sense of self” is pretty darn grim. For those of you who are fortunate enough to not be up on the terminology used by scholars of fan fiction, “Mary Sue” is a term deployed to criticize a fanfic character seen as being a poorly fleshed out and idealized stand-in for the author. I guess the point of this strip is to somehow prove that Les surely isn’t a Mary Sue character, because if he were, people would actually recognize him (“him” being either Les or Tom Batuik, I guess) in public! I’m not sure what a weird high-school-era flashback panel contributes to this message, structurally, but the important part is that total strangers feel absolutely no connection with or desire to speak to Les. None whatsoever. At last, we’re meeting the psychic scam artist who’s gotten Margo’s mother into her clutches! Who had “vaguely dowdy brunette with boring hair wearing a pastel turtleneck” in the pool? Oh, everybody? OK! Crankshaft’s been doing a pretty terrible series of Airport Indignity Laffs this week, but they, and the strip as a whole, have now ended abruptly as Crankshaft crawls into the baggage-handling mechanism and is crushed to death.